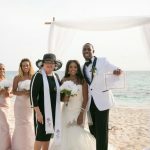 The Memorial Day weekend is over, and I thought it would be a good time to talk about how you can take a weekend break, and tie the knot in Grand Cayman. 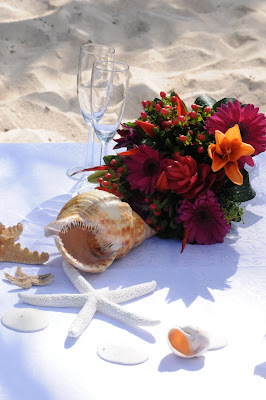 With just a little forward planning you can make your Grand Cayman wedding a simple, but meaningful event. 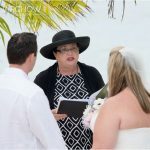 Having contacted me only a few days before, this couple from Chicago flew in on Saturday afternoon for their Memorial Day wedding. Peggy and I worked with them to provide transportation and witnesses for their simple wedding at Governor's Beach. The key to a weekend wedding is that we are able to apply for the Special Marriage License in advance, and pick it up once we have the couple's ship's cards or white immigration slips. Grand Cayman is served by most large airline companies, American, US Airways, Continental, Delta, Air Canada and British Airways. In addition, Cayman Airways, the national carrier of the Cayman Islands provides flights to the island from five US gateways, including JFK. There are several hotel chains which provide accommodation, including the Ritz Carlton, the Westin, the Marriott, Comfort Suites and Ramada. Additionally there are several smaller hotels which are locally owned and operated. Ask us for our recommendation, we do not accept commissions and recommend only those Cayman properties we can personally vouch for. 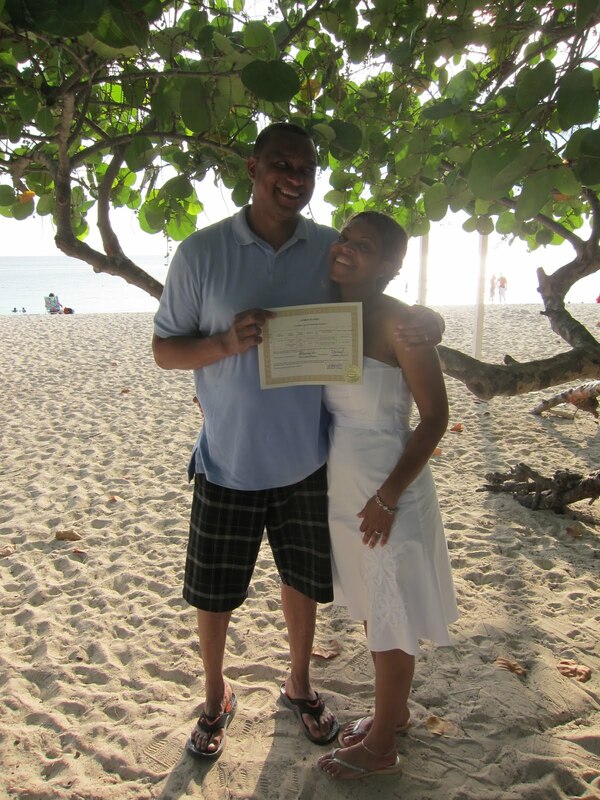 The newly-weds pose with their Certified Copy of the Marriage Register. 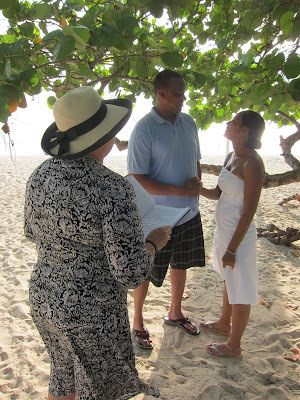 Since they left the next morning, we will post their Registered Marriage Certificate to them once their marriage has been filed. 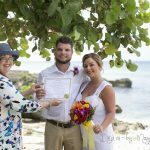 Of course we hope you will be able to spend several days enjoying our beautiful island, but if you only have a couple of days we will be happy to make the arrangements for your Cayman wedding. 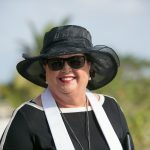 Remember summertime in the Cayman Islands is a good time to get flight, and accommodation bargains. Call Joy or Peggy (1345-949-9933) or email us here.